The Hebrew people, like many other ancient cultures, progressively elaborated a theology or a complementary spiritual interpretation proper to each letter of their alphabet. Because the Hebrew scriptures, and therefore the Hebrew alphabet was not formally codified until almost two hundred years after the birth of Christ, many letters were sometimes shaped in a variety of forms depending on the regions where Jews were living, either in Israel or in the Diaspora: somewhere outside of Israel, usually in the Greek speaking world. For our purposes, the last letter of the Hebrew alphabet represented the fulfillment of the entire revealed Word of God. 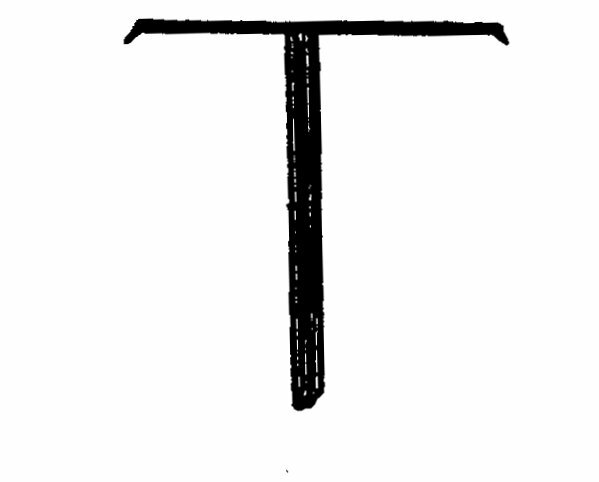 This letter was called the Tau (or Taw, pronounced “tav” in Hebrew) which could be simultaneously written: /\ X + T.
When the Prophet Ezekiel (9:4) uses the imagery of the last letter of the alphabet he is commending Israel to remain faithful to God until the last, to be recognized as symbolically “sealed” with the mark of the Tau on their foreheads as God’s chosen people until the end of their lives. Those who remained faithful were called the remnant of Israel , often the poor and simple people who trusted in God even without understanding the present struggle in their lives. Although the last letter of modern Hebrew (/\), is no longer cross-shaped as described in the variations above, the early Christian writers commenting on the Bible would have used its Greek version called the “Septuagint”. In this Greek translation of the Hebrew scriptures (which Christians call the”Old Testa- mente”) the tau was written as a T. Naturally, then, for Christians the T came to represent the cross of Christ as being the fulfillment of the Old Testament promises. The cross as prefigured in the last letter of the Hebrew alphabet, represented the means by which Christ reversed the disobedience of the old Adam and became our Savior as the “New Adam”. During the Middle Ages, the religious community of Anthony, the Hermit, of which Saint Francis was familiar, was very involved in the care of lepers. These men used Christ’s cross shaped like the Greek “T” as an amulet for warding off the plague and other skin diseases. In the early years of his conversion, Francis would have worked with these religious in the Assisi area and may have often been a guest in their hospice near St. John Lateran in Rome. Francis often spoke of meeting Christ disguised in the form of a leper as the turning point of his conversion. It is no doubt then that Francis eventually accepted an adapted the ‘T’ as his own crest or signature combining the ancient imagery of life-long fidelity to the passion of Christ which carried with it the command to serve the least, the lepers of his day. Even more specifically intensifying was the tau imagery. When Pope Innocent III called for a great reform of the Roman Catholic Church in 1215, Saint Francis would have heard the pope open the Fourth Lateran Council with the same exhortation as the Old Testament Prophet Ezekiel: ” We are called to reform our lives, to stand into the presence of God as righteous people. God will know us by the sign of the tau, T, marked on our foreheads.” This symbolic imagery, used by the same pope who commissioned Francis’ new community a brief five years earlier, was immediately taken to heart as his own call to reform. With arms outstretched, Francis often told his brother friars that their religious habit was in the same shape as the tau, meaning that they were called to be walking “crucifixes”, models of a compassionate God and examples of faithfulness until their dying day. Today, followers of Francis, as laity or religious, would wear the tau cross as an exterior sign, a “seal” of their own commitment, a remembrance of the victory of Christ over evil through daily self-sacrificing love. The sign of contradiction has become the sign of hope, a witness of fidelity until the end of our lives. Posted in Cross on December 23, 2009 by Dennis Mallon.